Like many readers, I adored Maria Snyder's book Poison Study, so it was with great eagerness and a little trepidation that I picked up Touch of Power. I'd heard that it was just as good as Poison Study or maybe even better; I was afraid that I would be disappointed. Not to worry. I loved Touch of Power! I immediately liked Avry. She is hunted by society for her healing powers, yet she can't help using her powers to help the innocent - even if it puts her own life in jeopardy. Lest you think that Avry is a boring do-gooder, Ms. Snyder has given her plenty of other qualities that makes her a full fledged character. As you'd expect from someone who is hunted and who has been on the run for years, Avry is highly independent and slow to trust. This lack of trust and tendency to assume the worst in people can be a little frustrating when the reader is sure that things are better than Avry thinks. However, once Avry's trust is earned it is unwavering and she will sacrifice much for those she loves. On the bright side, Avry has the funny, snarky voice that I love in my heroines. For our leading man, we have Kerrick. How I love thee Kerrick! He may eclipse Valek...or maybe not, I can't decide. A lot of other reviewers have criticized the book for making Kerrick too rude and mean to Avry. If I look back at the book objectively, I can definitely see that. However, I read the book with the starry eyed viewpoint of someone expecting romance, so Kerrick came off as witty, protective, strong, and someone who had his own reasons to be guarded. Let's not forget the merry band of brothers - Kerrick's gang. Like hanging out with the guys. Each had individual qualities - from young goofy Flea to strong stalwart Belen. They added a lot of humor to the story and helped make Avry trust Kerrick. I loved the tension between Kerrick and Avry. It definitely started out on the mean side, as I mentioned above. Understandable since neither party had reason to trust the other. Avry in particular had valid reasons to worry about what a potential captor would do to her - kill her or sell her. It turns out to be almost as bad in her mind - kidnapping her to force her to heal someone she despises. So the tension is definitely high. But it gradually changes to wary interest to grudging trust to mutual respect to deep friendship to love. My one complaint is that the love part took too long to develop. So long that we didn't get to really enjoy it. World building is always a key component of any fantasy novel. 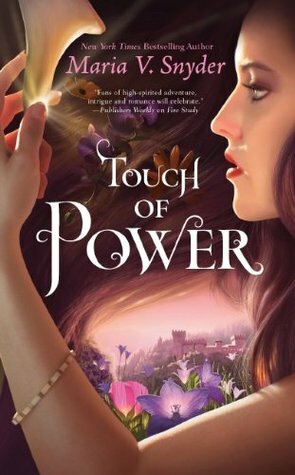 Touch of Power has a distinct fantasy world, complete with various magical powers, politics, illnesses, history, and more. Maria did a wonderful job of smoothly and consistently laying out the setting. There was no info dump, neither was I left in the dark for too long. I learned as much information as I needed to know at the time. Of course, a Maria Snyder book wouldn't be a Maria Snyder book without a fast moving plot. Touch of Power is full of action. The book starts off with a bang when Avry gets caught after healing a child. Then she's kidnapped by Kerrick and his gang. Then there is adventure after adventure. You don't know who to trust or what's going to happen to Avry. The romance and character development is mixed in with actions scenes so you never get bored. My chief complaint about the book is occasional unrealistic dialogue - Kerrick's gang in particular. They sounded too much like modern teenagers. For example, one of the guys teases "[Piece of clothing] is SO last year!" That mock valley girl talk feels out of place in a fantasy novel. There were other instances where the dialogue was jarring. It took away from the story. Touch of Power is a delightful novel. If you loved Poison Study, you will definitely love this book. If you haven't read Poison Study, read both books! Yay! I only read another series of this author but I'm so intrigued about this one. I saw a lot of wonderful reviews and I'm glad you enjoyed it. And well I just LOOOve the cover.thanks for the review. Lovely review! I really enjoyed this book as I have with Snyder's other series! I loved the gang of brothers, but I'm not sold on Kerrick yet. I really didn't find any chemistry between him and Avry. My hope is that a better love interest is coming soon! "If I look back at the book objectively, I can definitely see that. However, I read the book with the starry eyed viewpoint of someone expecting romance, so Kerrick came off as witty, protective, strong, and someone who had his own reasons to be guarded." This is how I see SO many of my YA book boyfriends! Logically I know that if I met someone who was dark and brooding and cocky, I'd be all "you're a bit of an a-hole", but in books they just work for me. I think you described it perfectly above:) Fictional boy beer goggles if you will. Glad you enjoyed this one Alison, I need to read some of her books! Happy to hear this is as good as Poison Study! I have read all the books in the Study series but the only one I loved was the first book. The series kind of got worse with each sequel in my opinion. Kerrick could be better than Valek? I don't know if I can believe this o.O I will have to find out for myself. Yeah, the dialogue at some points was a bit jarring for this fantasy but overall, quite enjoyable. And yay for Kerrick! This is definitely one of my 2012 favorites! It was my first Maria V. Snyder book and now I want to read the Poison Study series too! OMG what a beautiful cover! I love love love the Study series! I even just (hesitantly) let a friend borrow Poison Study with the hopes that she'd be hooked. I'm so jealous that you've already gotten Touch of Power and am relieved that you loved it- I was worried too that it might not live up to the Study series. Can't wait to get my hands on it! I really enjoyed Avry too especially her selflessness, and wasn't Kerrick great?